Fears of a European banking crisis have been on the rise in recent months, with the anxiety centering on two banks in particular: Germany’s Deutsche Bank AG (DB) and Italy’s Banca Monte dei Paschi di Siena S.p.A. (BMPS.Milan). The European Central Bank (ECB) on Friday rejected Monte dei Paschi’s request for more time to raise private money in a €5 billion recapitalization plan. The central bank had given the struggling lender until the end of the year to raise the money and hive off €27.7 billion of non-performing loans; the refusal to grant a three-week extension sent Monte dei Paschi’s shares down 10.6% to €19.50 at close Friday. That price leaves the bank – which has less than a month to raise several billion euro – with a market capitalization of just €571.8 million. Given the uncertainty caused by Italians’ rejection of Sunday’s referendum, the plan appears impossible to complete. In order to avoid the politically toxic measure of a bail-in, which would tap a large pool of retail bondholders to rescue the bank, the Italian Treasury is planning to take a stake of up to 40% in the bank, Reuters reported Wednesday. If Monte dei Paschi, Deutsche Bank or another vulnerable lender runs out of options, many fear that financial contagion reminiscent of the fallout from Lehman Brothers’ collapse could drag the world economy back into chaos. What ails European banks generally, and Deutsche Bank and Monte dei Paschi in particular? Can they be saved, and if not, can the financial system be saved from them? Why Are European Banks in a Crisis? Europe’s economy is mostly listless and in a few areas deeply distressed. Average unemployment in the 19-nation euro area is nearly 10%, and the rate is over 20% in Greece. The financial crisis in Europe that began when the U.S. mortgage bubble burst is still grinding across the continent in different guises, including the sovereign debt crisis that periodically threatens to pull Greece out of the eurozone. Despite the lingering effects of the financial crisis in Europe, the continent’s banks are still profitable: average return on equity was 6.6% in 2015, according to the International Monetary Fund (IMF), compared to 15.2% in 2006 and 2007. 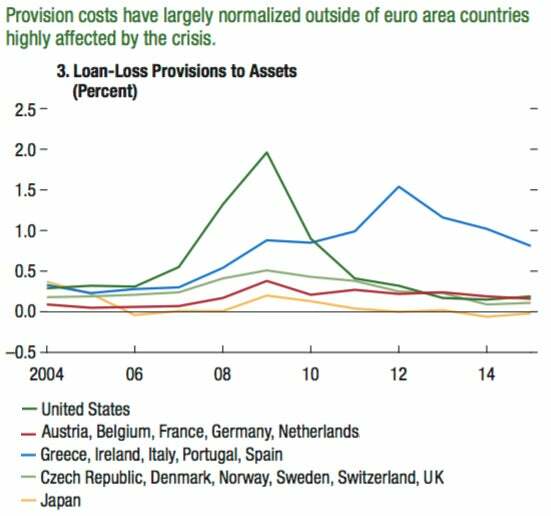 But borrowing and fee-generating activities have decreased, and non-performing loans continue to weigh on the sector, particularly in the “PIIGS” countries: Portugal, Italy, Ireland, Greece and Spain. Source: IMF Global Financial Stability Report, October 2016. Legend edited for space and clarity. If economic weakness has hurt banks, so have policymakers’ attempts to set the continent on a new course. New regulations have increased costs and cut into profits once achieved through risky trading strategies. Even more painful are negative interest rates, an unconventional monetary policy approach that first appeared in Sweden in July 2009 and has since spread to Norway, Switzerland, Denmark, Hungary and the 19 countries of the eurozone (as well as Japan). Six central banks have introduced negative interest rates to 24 countries since 2009 (note: not all rates shown are headline rates). Source: central banks. A look at Deutsche Bank and Monte dei Paschi’s stocks bolsters the idea that negative rates have been a nightmare for banks: the lenders’ shares lost 88.6% and 99.6% of their value in the nine years to June 30, respectively, as the ECB’s deposit rate fell from 2.75% to -0.4%. Monte dei Paschi’s stock closed at €18.90 on December 6; if it weren’t for a 100-to-1 reverse stock split on November 28, the price would be €0.19. For all the cyclical challenges facing Europe’s banks, their problems are not just cyclical. According to the IMF, the sector needs to cut costs and rethink business models. Consolidation is also necessary: the fund estimates that 46% of the continent’s banks hold just 5% of its deposits. If another sector fit the description above – bloated, with too many inefficient competitors scrapping over a highly-regulated, barely-profitable market – the solution might be to let competition do its bloody work. Unfortunately, as the world saw in 2008, some institutions are too big to fail. When Lehman Brothers’s radioactive portfolio of mortgages began to threaten the bank’s future in mid-2008, CEO Richard Fuld hunted for any sort of rescue, be it fresh investment, a merger, a buy-out, a change to Federal Reserve rules or an outright bailout. The bank ran out of options and declared bankruptcy on September 15, 2008, an event that laid bare the fragility of the global financial system. Over the following days, hedge funds that traded through Lehman’s London office found that their assets were frozen, sowing panic behind the scenes. The crisis erupted into plain view when major money market funds “broke the buck” – announced they would not be able to repay investors in full – sparking a flight from commercial paper that threatened to deprive large corporations in every sector of the cash they needed to pay workers and invoices. Gargantuan, system-wide government bailouts stopped the bleeding, but the world still feels the effects of a crisis triggered by a single bank failure eight years ago. On Friday, December 9, the ECB rejected a request from Monte dei Paschi di Siena for additional time to continue with a private recapitalization plan that got underway in late November. The three-week extension would have pushed the deadline to January 20; the rebuff sent Monte dei Paschi’s shares plunging by over 14%, with circuit breakers halting trading more than once. The stock pared losses slightly to close down 10.6% at €19.50. Faced with a year-end deadline to raise €5 billion in new capital and rid its balance sheet of €27.7 billion in bad loans – the net value of which is estimated at €9.2 billion – it appears increasingly likely that the €571.8 million bank (at close Friday) will be forced to take public money. Reuters reported Wednesday that the Italian government is preparing to take a controlling stake of up to 40% in Monte dei Paschi, in what an unnamed source called a “de-facto nationalization.” The €2 billion injection, which could take place as soon as this weekend, will reportedly take the form of bond purchases by the Treasury: retail investors numbering around 40,000 will receive face value for their bonds, which the government will then convert to shares in the bank. Monte dei Paschi’s stock rose 10.8% Wednesday in response to the news. The government has been forced to resort to a bailout because voters rejected a referendum on constitutional reforms on Sunday, December 4. Following the vote, which saw “No” triumph by nearly 20 percentage points, Prime Minister Matteo Renzi announced he would resign. His exit has the potential to set off a destructive chain reaction: the Five Star Movement, a euroskeptic party, could come to power as a result. Its leader, former comedian Beppe Grillo, has called for a referendum on Italy’s leaving the eurozone. A far-right party, the Northern League, also stands to gain from the anti-establishment rebuff. Medium-term political uncertainty has led to acute short-term uncertainty for Monte dei Paschi. Citing unnamed Italian officials and bankers, the Financial Times (FT) reported on November 27 that perhaps eight of Italy’s ricketiest banks could fail in the event that a “No” vote set off market turbulence and endangered rescue plans designed to save them from a bail-in. The euro dropped to a 20-month low against the dollar following the vote; by Monday afternoon EST, the currency had more than recovered those losses, but Monte dei Paschi proved less resilient. Its shares closed down 4.2%. The €5 billion recapitalization plan, which appears likely to be abandoned, was developed by JPMorgan and unveiled on October 25. It called for the Italian lender to raise €1.6 billion through junior bondholders’ agreeing to convert debt to equity. Atlante, a rescue fund for Italy’s banks, would stump up another €1.6 billion, and a new bond issue would cover the balance. A Qatari government fund was mulling an “anchor” investment of around €1 billion, depending on the outcome of the referendum. To sweeten the deal for investors, Monte dei Paschi said it would target €1.1 billion in net profit by the end of 2019. The bank has already eliminated its dividend; to cut costs further, it announced in late October a plan to slash 2,600 jobs and shut 500 branches. Investors remained skeptical: shares fell by over 20% after the announcement, leading authorities to temporarily halt trading in the stock. Bank of America Merrill Lynch analysts were hesitant as well, asking in a research note if it is “even possible” to raise €5 billion in fresh capital for a €550 million company (at close on October 25). Monte dei Paschi began exchanging subordinated bonds for equity in late November in the first stage of the recapitalization plan. On December 2 it said it had raised around €1 billion in the swap. The same day, the Italian daily Corriere della Sera reported that the government was in discussions with the European Commission regarding the terms of a bailout for the bank, apparently anticipating the results of the referendum. When voters rejected Renzi’s reforms two days later, already wary private investors were unwilling to go forward with the rescue plan. The hope is that, once the Italian Treasury has become the bank’s controlling shareholder (it is already the largest, with a 4% stake), private investors will be confident enough to fill in the €2 billion gap left by the €1 billion debt-for-equity swap and the government’s €2 billion investment. If the bank is not recapitalized or bailed out by the end of the year, it may have to resort to a bail-in. EU rules that went into effect at the beginning of the year require that junior bondholders take a loss amounting to 8% of assets before taxpayers can be tapped for a traditional bailout. In countries where bank bonds are mostly held by institutions, that might not be a disaster, but Italy’s tax code and cultural norms encourage retail investors to hold bank bonds – around €200 billion nationwide. A much smaller bail-in caused an Italian saver to kill himself in December 2015. Renzi tried for months to convince Brussels to allow for the use of public money, but Germany and others in Europe’s “core” were in no mood for taxpayer-funded bailouts. “We wrote the rules for the credit system,” German chancellor Angela Merkel, who is facing elections in 2017, told reporters in June. “We cannot change them every two years.” In the wake of the referendum, circumstances appear to have changed. Stress tests conducted by the European Banking Authority in July found that, nearly eight years after the financial crisis began, the continent still harbored at least one bank liable to walk off a cliff in a downturn. Monte dei Paschi, Italy’s third-largest lender, saw its fully-loaded common equity Tier 1 (CET1) ratio, a risk-weighed measure of capital, fall to -2.4% in 2018 under the test’s adverse scenario. In other words, the bank would be insolvent, and its collapse could potentially lead to other bank failures. It was the only one among 51 banks surveyed to earn that distinction, though struggling Greek, Cypriot and Portuguese banks were excluded from the test. Monte dei Paschi’s struggles were well-known going into the stress tests. The lender had unveiled a restructuring plan just hours beforehand, showing it was not banking on a pleasant surprise. Founded in 1472, Monte dei Paschi is the world’s oldest surviving bank, but in this case antiquity does not imply stability. Prior to the first quarter of 2015, when it turned a modest profit, it had lost money for 11 straight quarters – over €10 billion in total. In the three months to September the bank swung to loss again, of €1.2 billion. Note: net revenue and net income figures are shown as restated; share prices are adjusted for splits up to September 30. Shortly before Europe’s financial crisis struck, Monte dei Paschi bought Antonveneta from Banco Santander S.A. (SAN) for an inflated €9 billion. In 2013 that acquisition – funded by a complex hybrid instrument designed by JPMorgan Chase & Co. (JPM) – became the subject of an investigation that also uncovered complex derivative contracts with Deutsche Bank and Nomura Holdings Inc. (NMR), which Monte dei Paschi management had used to conceal losses in 2009. Three former executives received 3.5-year prison sentences in connection with the fraud in 2014. Monte dei Paschi took a €1.9 billion bailout in 2009 in the form of Tremonti bonds, named for the finance minister at the time. These were hybrid securities designed for sale by struggling banks – four in all, three of which had repaid by mid-2013 – to the Italian government; the proceeds counted towards regulatory capital requirements. Monte dei Paschi ducked out of the European bailout of Spain’s banking system in 2012, but the following year it sold Italy €4.1 billion in rejiggered Tremonti bonds (known as Monti bonds after Tremonti’s successor). Of this sum, €2.1 would substitute for the first bailout, including interest. The bank has raised around €8 billion through additional rights issues since 2014, diluting previous shareholders’ stakes, yet its market capitalization as of December 7 is a mere €614 million. Ironically, given Merkel’s avowed reluctance to bail out banks, the other European institution that keeps markets up at night hails from Germany. 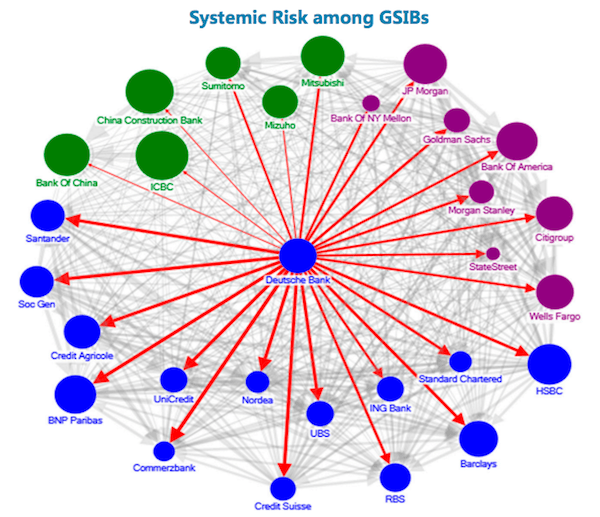 In June, the IMF named Deutsche Bank “the most important net contributor to systemic risks” among the so-called global systemically important banks (G-SIBS). Linkages among global systemically important banks. Size of bubbles indicates asset size; thickness of arrows indicates degree of linkage; direction of arrows indicates direction of “net spillover.” Source: IMF Financial System Stability Assessment, June 2016. Few expect Deutsche Bank to pay the full amount, which could push it over the brink. Citigroup Inc. (C) talked the DOJ down to $7 billion in 2014 from a $12 billion initial ask. Other fines for similar activity range from Morgan Stanley’s (MS) $3.2 billion to Bank of America Corp.’s (BAC) $16.7 billion. Even with a diminished fine, though, Deutsche Bank is in a precarious position. As of September 30, it had €5.9 billion ($6.4 billion) set aside for litigation expenses, up from €5.5 billion at the end of the previous quarter. JPMorgan analysts wrote on September 15 that a final bill over $4 billion would raise questions about the bank’s capital position. They pointed out that the mortgage-backed security probe is not the last potentially costly legal issue Deutsche Bank could face in the near future: an investigation into money laundering for Russian clients is also underway. Speculation began to swirl that Germany would flout the bail-in rules it had expended such political energy to defend, though Merkel has ruled out state assistance, according to government sources quoted in Munich-based Focus magazine. Deutsche Bank’s CET1 capital ratio has fallen since the end of 2014, though it rose slightly in the third quarter of 2016 to 11.1%. At 10.8% in June, the ratio was around €7 billion shy of CEO John Cryan’s 12.5% end-2018 goal. Selling Postbank and its stake in Hua Xia Bank Co. Ltd. will likely bring Deutsche Bank closer to that target, but stricter rules could push its capital ratio even lower. While Deutsche Bank has taken a few heavy losses since the financial crisis in Europe began, it could conceivably have built up more capital through retained earnings and avoided looking so brittle when the DOJ came knocking. John Cryan, the bank’s CEO since July 2015, has set his sights on executive pay, telling a conference in Frankfurt that November, “many people in the sector still believe they should be paid entrepreneurial wages for turning up to work with a regular salary, a pension and probably a health-care scheme and playing with other people’s money.” Chief financial officer Marcus Schneck told investors on October 27 the bank would dispense with cash bonuses for the year and may tie executive compensation to the stock price. On November 17 Süddeutsche Zeitung reported that Deutsche bank may cancel six former executives’ unpaid bonuses, without specifying the amount. In fairness, shareholders have taken a greater share of earnings than executives – though not per head – in the form of dividends, which were discontinued in 2015. Better-than-expected third-quarter earnings of €278 million, announced on October 27, have given Deutsche Bank a moment to catch its breath, but the firm remains vulnerable, and it does not have to be the European banking crisis’ zero cell to contribute to the carnage – it could serve as a conduit. Deutsche Bank reported net exposure to Italian financial institutions of €1.9 billion at the end of the third quarter, up €1.1 billion from year-end. Its net credit risk exposure to the PIIGS countries is €31.1 billion, up €4.9 billion. Will There Be a European Banking Crisis? The ultimate question is whether, if one of these banks or another were to collapse, the world would see a repeat of the Lehman moment. Kevin Dowd, professor of finance and economics at the University of Durham, answered this question in stark terms in an August report for the Adam Smith Institute: “Once contagion spreads from Italy to Germany and then to the UK, we will have a new banking crisis but on a much grander scale” than in 2007 and 2008. Not everyone agrees. “No, I don’t see them as the next Lehman,” Harvard Law School professor Hal Scott told Investopedia on October 31. “I think that there are problems that are idiosyncratic to some extent to each bank. I don’t see panic ensuing from how they’re dealt with.” In fact, he sees the European banking system as having “more capability to handle a contagion than in the United States,” due to Americans’ unwillingness to see a repeat of the 2008 bailouts. The second weapon is the Single Resolution Mechanism, what Scott called a form of “standing TARP,” which envisions the use of banking industry contributions, creditors’ money and public funds to resolve failing banks. Finally, while the EU lacks a system-wide deposit insurance scheme, there are rules governing national schemes, which guarantee up to €100,000 per depositor per bank. If and when something goes wrong in Europe’s fragile banking system, avoiding a full-blown financial crisis in Europe will likely depend on policymakers’ ability to quickly reassure markets and depositors. According to Scott, national and continental authorities’ capabilities are “more than adequate.” On the other hand, judging by the state of Europe’s banks nearly a decade after the initial crack-up, resolving crises quickly may not be the continent’s strong suit.